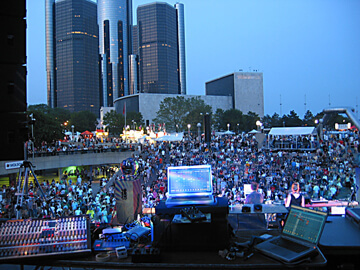 The Detroit Electronic Music Festival, better known as DEMF, is a weekend long event that brings the finest that electronic music has to offer into Hart Plaza in Detroit. Also known as Movement, the festival features dozens of the top artists in the industry. It attacts over 100,000 attendees, so it is always a wild time. Bring your glowsticks and get downtown for one of the world's best electronic music festivals! Detroit is the birthplace of the Techno genre, so it's no wonder that the Detroit Electronic Movement Festival is so popular among festival goers. It's a special time to commemorate a genre of music that has brought people together in dance for years! You're sure to have an amazing time at this bustling festival, as it has a youthful vibrance that can't be simulated. One way to make your Detroit Electronic Music Festival experience the best it can be is by renting a limousine or party bus for the festivities. You can start and end your festival experience in a spacious, climate controlle vehicle with updated features to keep you as comfortable as possible in the summer sun. Be sure to check out all of your transportation options and rent a limousine or party bus!